The Linguistic Spy is back on British soil and ready to continue broadcasting authentic everyday English expressions. Today’s catch is the verb ‘to hog‘. 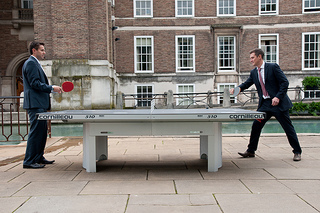 As I was walking in the city centre I saw some table tennis tables that were free for the public to use. However, there was a notice saying ‘Please do not hog the tennis tables’. I’ve never come across this word before and had to turn to the dictionary, which said that ‘to hog‘ means to ‘take or use a lot of something in a way that prevents other people from having it’. – Countries from northern Europe (including Scandinavia) would tend to hog the medals. They would be particularly strong in recycling, the waste triathlon (reduce, reuse and recycle), the animal rights dressage and the synchronised swimming, where judges look for strong performance on diversity (The Guardian). – The Inuit represent less than half the Arctic’s indigenous people, who in turn account for only 10% of the region’s population. Yet they still hog the headlines because their culture is under attack from climate change (The Economist). – Japan needs a robust and diverse energy industry. Instead it has ten regional monopolies (TEPCO is one), which hog 97% of the market for electricity generation and transmission (The Economist).